Ryan, his wife Jessica and their dog Max have moved to a new house in the country. Grace is pregnant, and Ryan increasingly finds himself on the verge of being consumed by his mental illness. But are the disturbing visions plaguing him a figment of his troubled mind, or a hint at a greater truth? 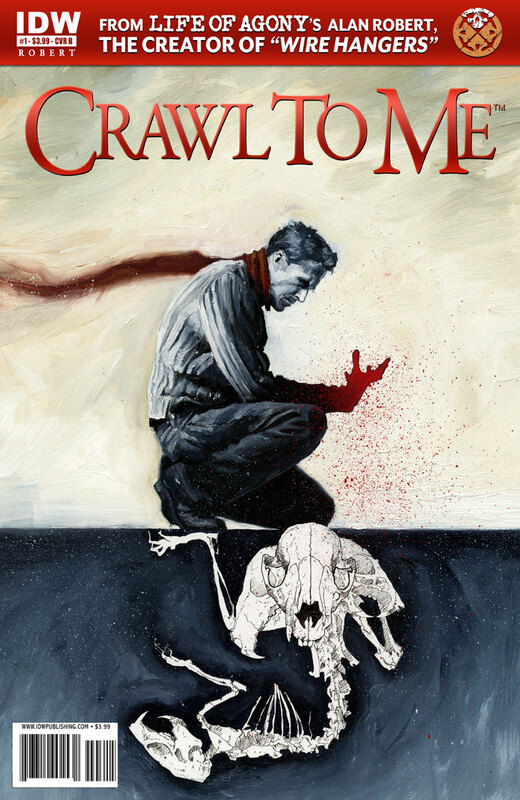 Crawl to Me does psychological horror really well; and it does so in a way that is simultaneously very upfront about the material that it’s dealing with (mental health), and completely able to blindside you with its conclusion. Which is a pretty impressive feat all on its own. A surreal and oppressive tension laces both the words and artwork on each page, and the almost frenetic styling of the art lends itself so well to the character’s loss of control over his own thoughts. It’s almost as if Ryan is drawing his own experiences as they happen, with the most clarity being given to those moments that haunt him the most. I hesitate to call it a weakness, given the material being dealt with, but there are times when things get a bit too chaotic to follow. That the line between reality and hallucination is not only blurred, but absolutely destroyed, is a given – but in those moments where things get a little too messed up, it’s hard to maintain the focus that Crawl to Me otherwise demands. Given the strength of the its ending, though…well, I can forgive Crawl to Me some minor issues here and there, and recognise it for the strong work that it is.